1) Bidirectional active energy measurement, reverse energy accumulated to positive energy. 2) Measuring the total accumulative and balance. 3) Using STS encryption techniques and protocol certified by STS commitment. 4) Can be used to charge energy, set key, clear tampering sign and so on. 5) Multi-level remaining power, the meter will alarm when the remaining power is low. 7) stock limit, then the credit amount transferred will be refused, but the Credit amount transfer token is still valid. 8) Alarm: When remaining credit crosses the minimum credit (5.00kWh, 2.0kWh, 0.5kWh), the warning LED glitter, LCD also indicates the warning symbol to remind user to purchase credit. 9) Open upper cover and terminal cover detection whether the meter is power on or off. 10) Design the meter according to IEC 62055-41, IEC62055-31, and IEC 62055-51. 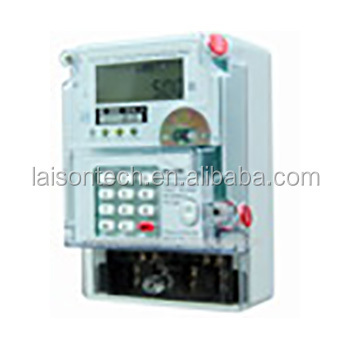 11) The meter will automatically switch off when the remaining power was used out.